Disneyland Paris Minnie Mouse Effiel Tower Charm. Available in FREE Pouch. 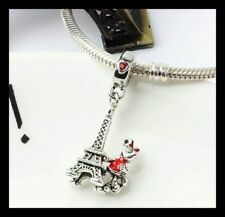 Charm Shape:Eiffel Tower. Here at Charming Beads we have everything you need to begin making beautiful, bespoke jewellery. You can use them throughout your piece for a truly glamorous look, or use them as accents combined with other kinds of beads for a wonderfully subtle effect – at these prices, the only limit is your imagination! GENUINE SILVER AND HALLMARKED S925 ALE. 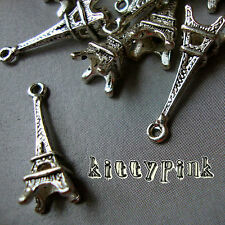 Quality 3D Eiffel Tower Charm Jewellery Findings. Colour: Antique Silver Plated. All ready for fast dispatch. Size: approx 24 x 9mm. Quantity: 10. Huge range of unique finds. Unique Range. High quality products at amazing prices. Lovely MINNIE Mouse charm, this would make a lovely gift or addition to your own bracelet. This charm is well made and detailed. Size: 24mm x 9mm. Colour: Dark Antique Silver. Quantity: 10. EIFFEL TOWER. Buy a quality Sterling Silver Charm Bracelet to add your charms to HERE. Approx Charm Size - 23mm x 8mm x 8mm. Approx Charm Weight - 1.5gms. A beautiful charm that will make the perfect addition to your collection. 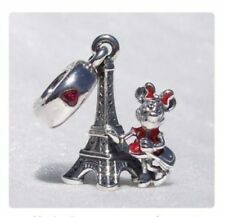 Genuine Pandora Minnie Paris Eiffel Tower sold with free Pandora black velvet pouch. Purchasing more than one item?. Free Gift Pouch. Your gift pouch will be selected at random unless a particular colour is requested. Purple velvet. Gift pouches available:-. In most cases this will be S925. CB Silvercharms. Red velvet. Eiffel Tower. France French Paris charms. Sterling Silver 925. This item is made in England. It will not bear ANY marking unless over 7.78 grams silver or 1 gram for gold. PANDORA EIFFEL TOWER CHARM. Pandora No: 791082. Pandora Eiffel Tower Charm. Condition is Used. Authentic Genuine Pandora Charm Silver bead / charm. Genuine Pandora Eiffel Tower with Gold Plated Heart Pendant Charm 791302 With free Pandora pouch. S925 ALE. If you would like this item with gift packaging consisting of Pandora hard cushioned box & Pandora gift bag for an additional £5.00 please message me for the item number for purchase. New & Unused. Postage is Royal Mail second class signed for. 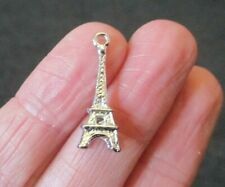 Authentic Pandora Silver 791082 Eiffel Tower Dangle Charm PA2095. Up for sale is 100% Authentic Pandora Charms.